What is the Speech from the Throne? The Speech from the Throne is both practical and ceremonial. On the practical side, it signals that the government is opening a new legislative session. The Speech from the Throne summarizes what the government expects to achieve during the session. The contents of the speech are prepared by the premier and the government in power. Ceremonial delivery of the Speech from the Throne is done by the Lieutenant Governor of Manitoba. In a ceremonial sense, governing the province is the responsibility of the Crown. That responsibility is delegated to the Lieutenant Governor whose primary responsibility is to ensure that a properly elected government is always in place in Manitoba. If for any reason, the Lieutenant Governor is unavailable to read the Throne Speech, the Chief Justice of the Province of Manitoba will be called upon to fulfill the role. It is traditional for the senior-ranked judge of the highest court to stand in as representative of the Crown when needed. After the Throne Speech has been read, a motion is made to thank the reader and accept the speech. Often, members of the legislature who are not part of the government, will move an amendment to the motion. Both the amendment and the motion are debated for eight days before putting them to a vote. Should the motion to accept the Throne Speech not pass, the government would fall. Manitoba's system of provincial government came indirectly from The British North America Act, 1867 passed by the British Parliament. Brought to Canada as The Constitution Act, 1867, it established Canada's confederation and a government modelled after the British parliamentary democracy. When Canada's new parliament passed The Manitoba Act, 1870, it established us as a province and outlined how our government would operate. The seeds for the British system of government were sown over hundreds of years as the traditional monarchy began giving way to the will of the people. A spectacular example of this was the signing of the Magna Carta by King John of England in 1215. That document was the inspiration for centuries of change that limited the arbitrary powers of the monarchy and gave increasing powers of liberty, self-determination and freedom to the people. Delivery of the Speech from the Throne acknowledges that our system of government is based on hundreds of years of British tradition. As the British parliamentary system of government developed, the mace, originally a weapon used to protect the Speaker, has evolved into a symbolic emblem of the authority of the Speaker and the House. 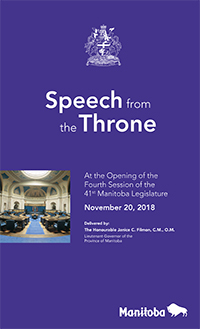 Respect for tradition brings society's elite, military, court judges, industry leaders, media members, government representatives, public and members of the Manitoba Legislature together to witness a Speech from the Throne. They are summoned by the presence of the Lieutenant Governor representing the Crown and the highest authority in the province.